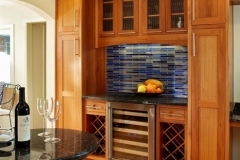 Remodeling your kitchen can add more than value to your home. 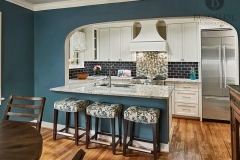 Whether it’s a full kitchen renovation or a simple upgrade of fixtures, countertops, and cabinets, designing a kitchen that you truly love will make your house truly feel like home. Kitchens are also a great place add in environmentally friendly features like energy-saving appliances, air filters, and sustainable materials for items like flooring. The homeowners on this project were moving to Dallas in order to be closer to their new grandchild. This house was in the perfect location but needed some work. 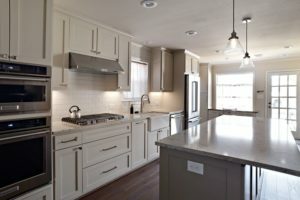 The house was a new build spec home and it showed – there was very little planning or design intent discernible in the kitchen, laundry room, or master closet. 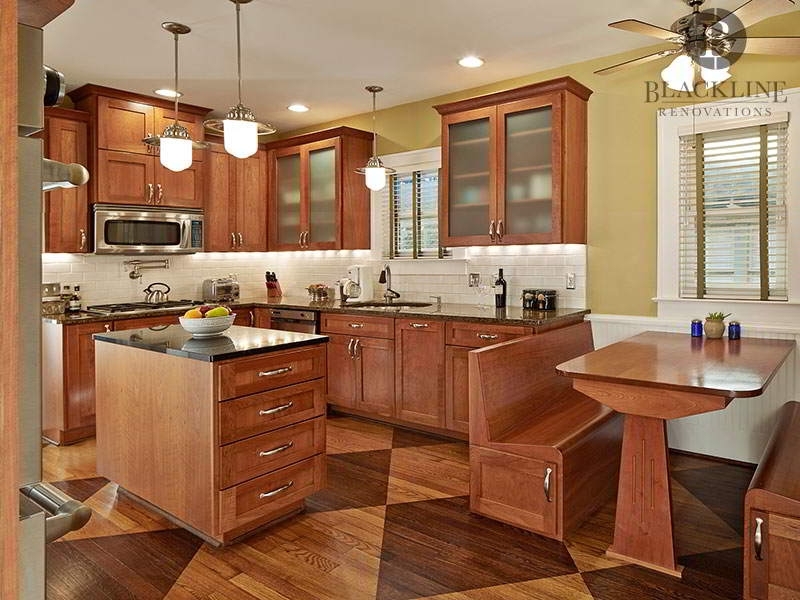 The team at Blackline designed a new island to create better flow in the kitchen and a more functional work triangle. The kitchen is much more bright, open and functional. The homeowners on this project were trying to downsize from their existing home, but wanted to stay in the same neighborhood. They found the perfect townhome, but it needed a lot of work. The kitchen was dark and dated, and although it was a good size, it had very inefficient storage. We completely tore down the original space. 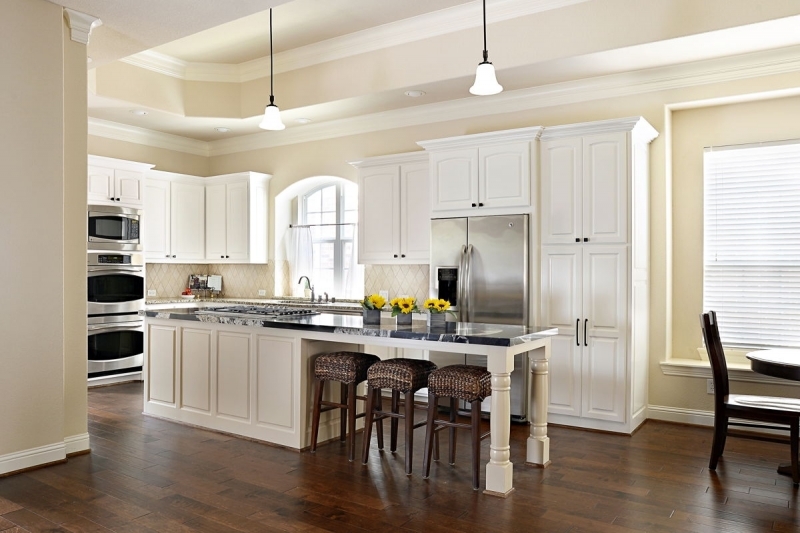 The overall layout of the kitchen stayed, but we installed new custom cabinetry to match the traditional style of the home. New quartzite countertops, appliances, plumbing fixtures, tile flooring, and subway backsplash really freshen up the space. We added LED recessed lighting and under cabinet lights to really brighten up the space and make it much more functional. 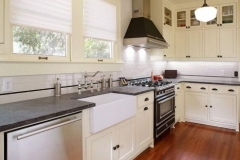 The homeowners came to us with a dark, dated kitchen in need of an update. 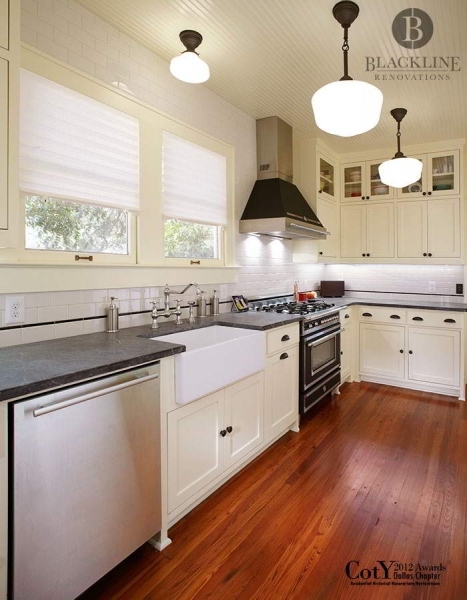 The kitchen had never been remodeled in the 80 years since the home was built. It had a very small footprint relative to the size of the home and the layout made it almost unusable. We took the kitchen down to the studs, combined the old kitchen space with an adjacent dining space and reconfigured the master closet to increase the width of the kitchen in order to accommodate a large island. 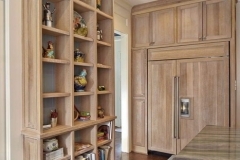 Custom ceiling-height cabinetry maximized the storage in the kitchen, and the concealed laundry area allowed for functionality, while keeping the clean aesthetic the homeowners wanted. 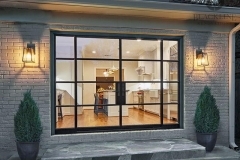 To brighten up the space we removed a large portion of the exterior wall and installed a custom glass and steel door system allowing a ton of natural light into the space as well as a great view to the backyard. The homeowners came to us seeking an update and expansion of their home to meet their current and future needs. The layout of the home, while functional with a fairly spacious living area, was cramped in most other areas including the kitchen, and lacked good space for storage. 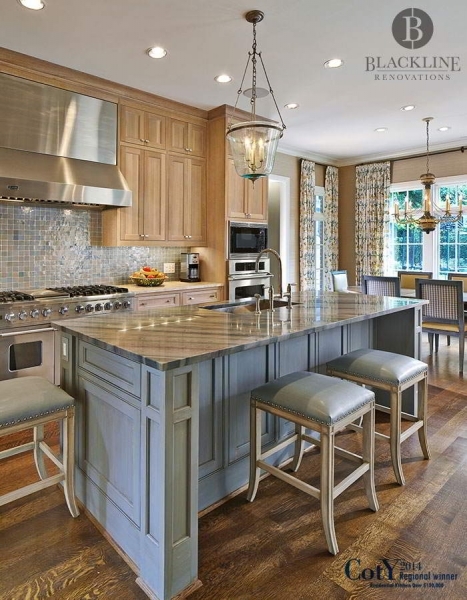 Their main goal was to expand the kitchen and create an open flow for entertaining. To achieve their goal, it was determined that adding a second floor would be the best option so that they would not lose any backyard space. The second floor addition included a playroom, kid’s bed and bath, and new guest bed and bath. By moving these spaces upstairs, and building on a small addition to the first floor, we were able to create a more spacious downstairs layout with an open flow for entertaining and added storage the homeowners needed. 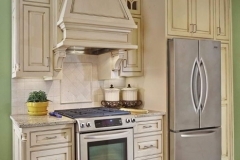 The new kitchen layout featured a large centered range with a custom vent hood. Arched cased openings between both the kitchen and the living area provide separation, but allow for the open flow for entertaining they were looking for. 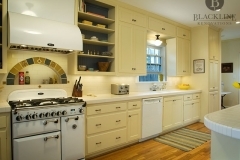 The homeowner loved the charm and character of her home, but the original kitchen left much to be desired. 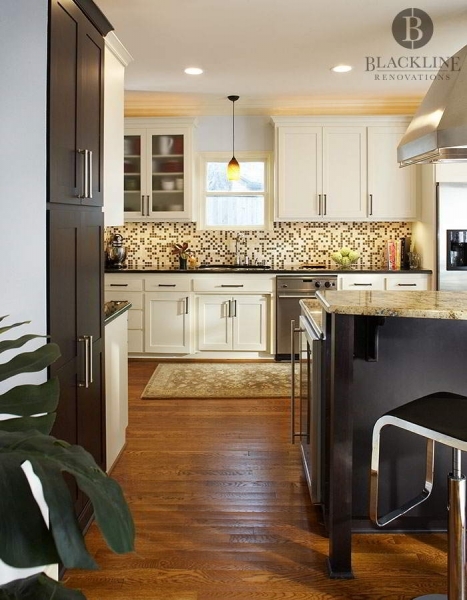 Her goals were to update the kitchen finishes to coordinate better with the rest of the home, make the space feel less cramped and more open, and maximize the efficiency of the small space. 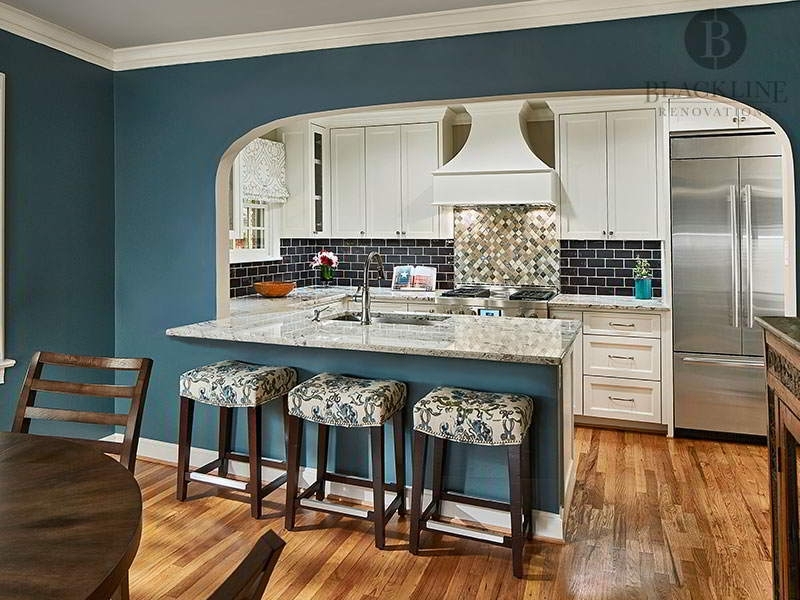 By working with an interior designer (J. Wiley Designs), we were able to keep the kitchen cohesive with the look and feel of the rest of the home. We relocated the entry of the kitchen to create a more direct route to the master suite and guest bedroom, creating a new U-shaped kitchen layout and much better flow for the home. 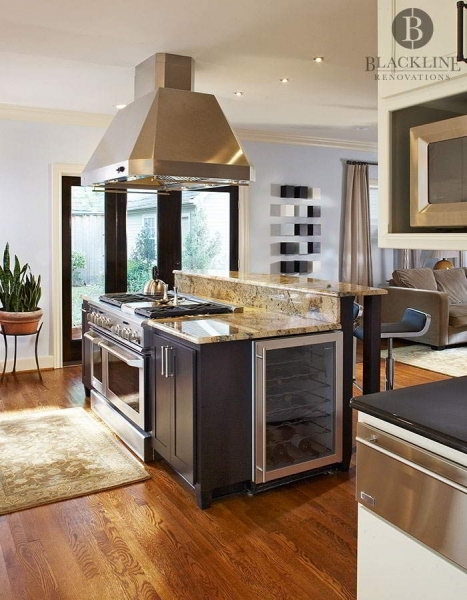 We relocated the cooktop to the exterior wall and added a custom decorative vent hood – relocating the sink to the peninsula to create a safer work space. The countertop at the peninsula was expanded to allow for casual barstool seating, and additional work space if needed. The homeowners purchased this home to be next door to their son and his family. The home was dated, but the bones of the structure were good, plus it came with a pool. The homeowners were looking to create a space they could be comfortable staying in when they came to visit, and also to be used by their son and his family when they weren’t there. We completely redesigned and reconfigured the entire home. For energy efficiency, all the windows and exterior doors were replaced, and new insulation was installed. 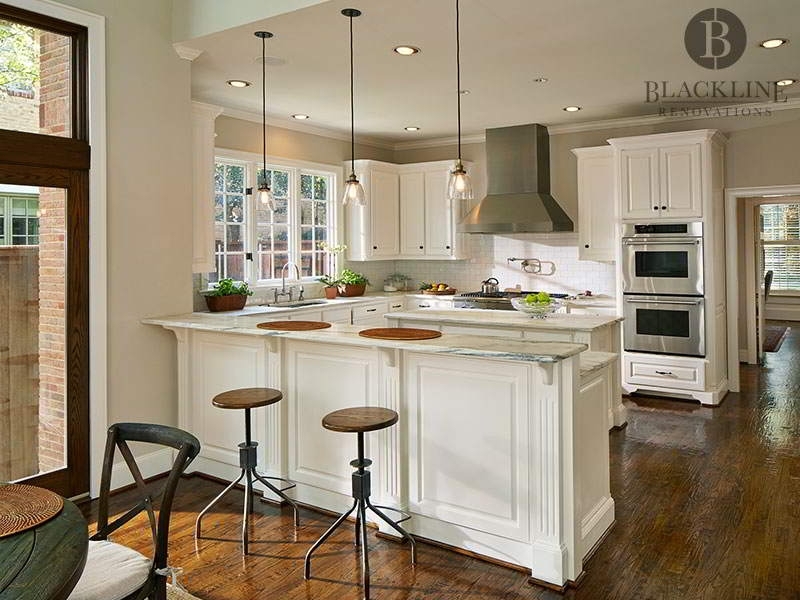 The larger kitchen features a more efficient layout with custom storage and an L-shaped island with casual seating. The ceiling in the living and dining area was vaulted to add to the open feel of the space. New hardwood flooring was installed throughout the home to really tie all of the new spaces together and create one cohesive home. This project started with the homeowner’s desire to replace their existing range and grew to incorporate the whole kitchen and downstairs living area adjacent to it. Their goals for the project were to create a more open kitchen to the downstairs office/media room and upgrade all of the finishes and appliances. The design of the space focused on creating a balanced and open layout while maintaining visual separation between the spaces. We framed a large new doorway between the kitchen and media room and installed new pocket doors that could be closed when the homeowners were entertaining, or when their children were using the media room. This project started with the homeowner’s desire to replace their existing range, and grew to incorporate the whole kitchen and downstairs living area adjacent to it. Their goals for the project were to create a more open kitchen to the downstairs office/media room and upgrade all of the finishes and appliances. This project started with the homeowner’s desire to replace their existing range, and grew to incorporate the whole kitchen and downstairs living area adjacent to it. Their goals for the project were to create a more open kitchen to the downstairs office/media room, and upgrade all of the finishes and appliances. The homeowners for this project desired to move to an area renowned for its great school system. 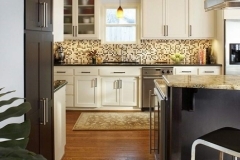 They found a house that met their requirements but needed a fully redesigned kitchen. 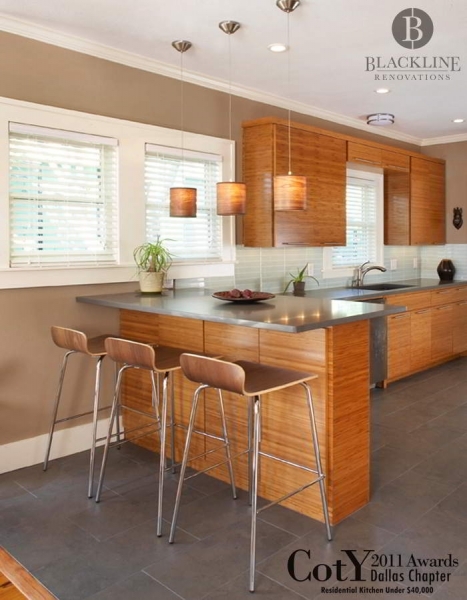 Their goals were to improve the existing floor plan by increasing the usable area in the kitchen and improve the overall circulation of the home. We removed many of the partition walls and reconfigured the space to create a large kitchen with an adjacent butler’s area and pantry. As a result, the kitchen is completely open to the family room. 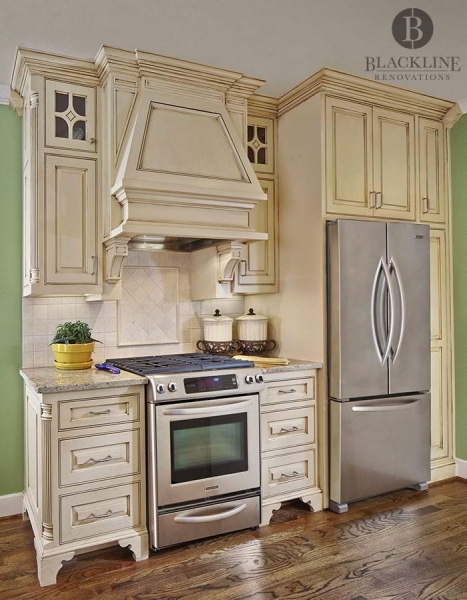 The shaker style cabinets and marble countertops help balance the stainless steel of the appliances. 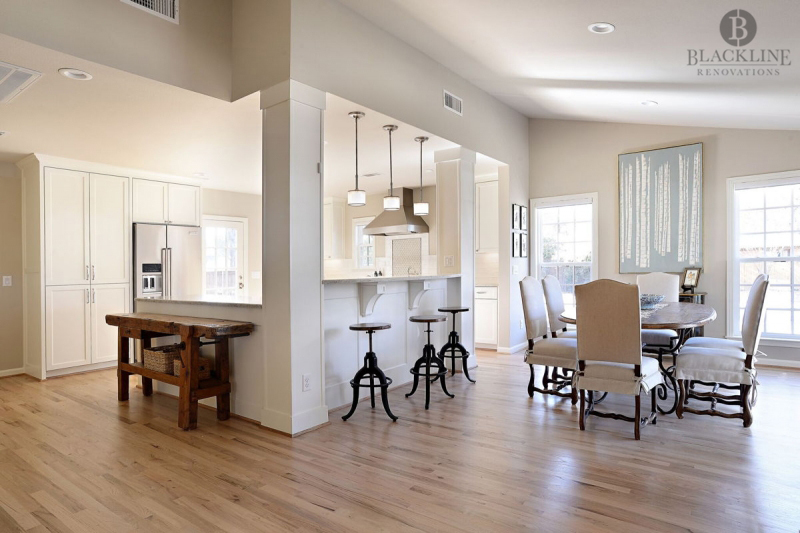 And the warm wood floors really center the space. The homeowners for this project desired to move to an area renowned for its great school system. 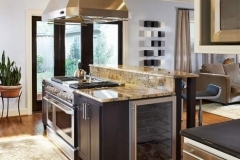 They found a house that met their requirements, but needed a fully redesigned kitchen. Their goals were to improve the existing floor plan by increasing the usable area in the kitchen and improve the overall circulation of the home. 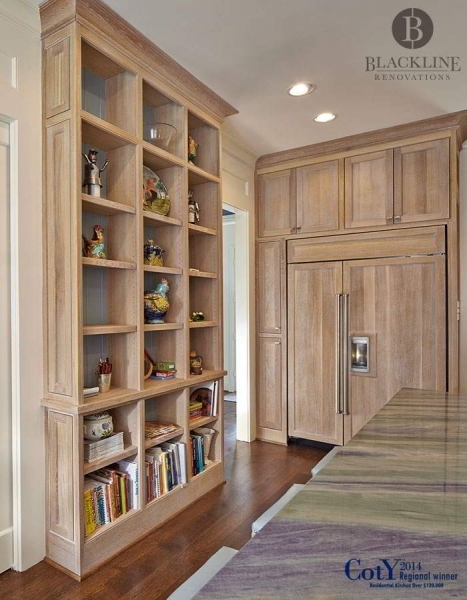 We removed many of the partition walls and reconfigured the space to create a large kitchen with an adjacent butler’s area and pantry. As a result, the kitchen is completely open to the family room. 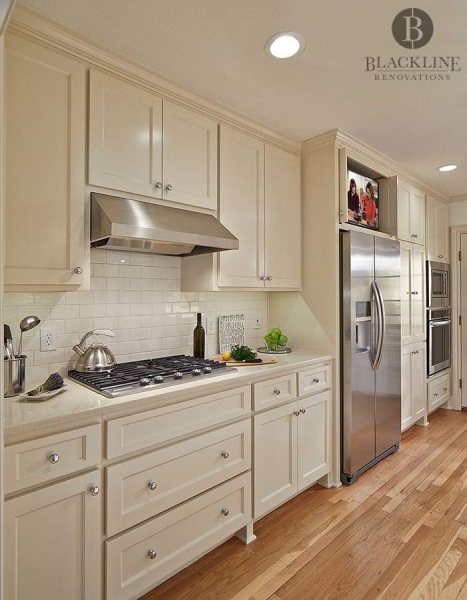 The shaker style cabinets and marble countertops help balance the stainless steel appliances. And the warm wood floors really center the space. The kitchen for this project was in desperate need of an update as it hadn’t been remodeled since the 70’s. The homeowners' desire was to increase storage and create a more efficient layout. 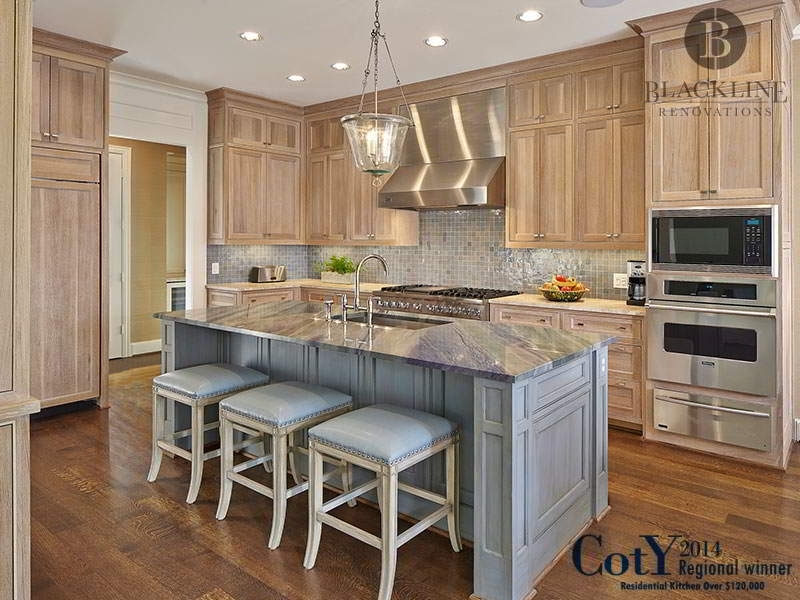 By adding a custom island, we greatly improved the efficiency, and added the needed work surface and staging area the home needed. 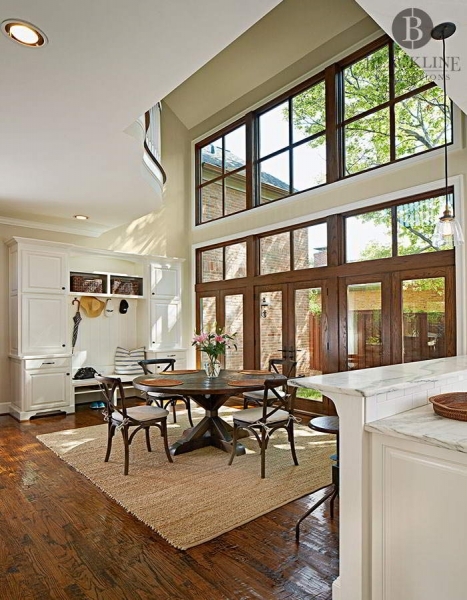 By removing all of the doors, and framing new, wider arched openings, we were able to make the kitchen feel more expansive without reducing the cabinetry. The kitchen for this project was in desperate need of an update, as it hadn’t been remodeled since the 70’s. The homeowners' desire was to increase storage and create a more efficient layout. Before moving into this home, the homeowners knew some of the design and layout wouldn’t work for their family. 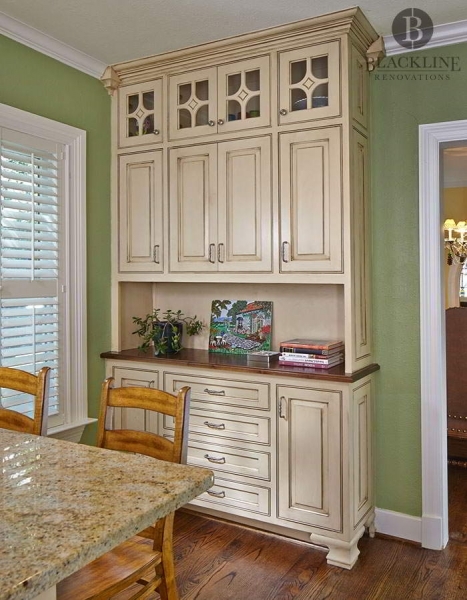 An outdated elevator took up floor space in the breakfast room and greatly reduce the light to the space. The homeowners really wanted to modernize the space and make it fit their growing family. By removing the old elevator and tearing down the wall dividing the elevator from the breakfast room, existing windows flooded the space with natural light.The kitchen countertops were replaced with honed marble and the new edge detail was simplified, adding to a more modern feel. 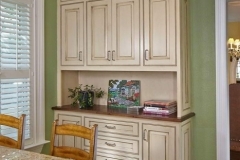 All of the existing cabinetry was painted a bright, crisp white to tie everything together. 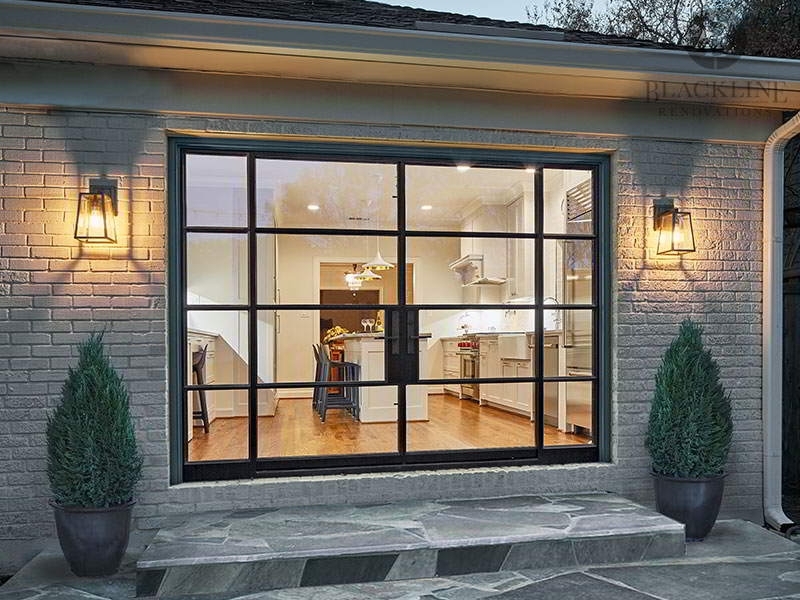 The homeowner had two main needs for this project: fix a poor layout and update a bland look. The original kitchen was tiny and lacked storage and counter space – all of the appliances were freestanding, including the dishwasher! 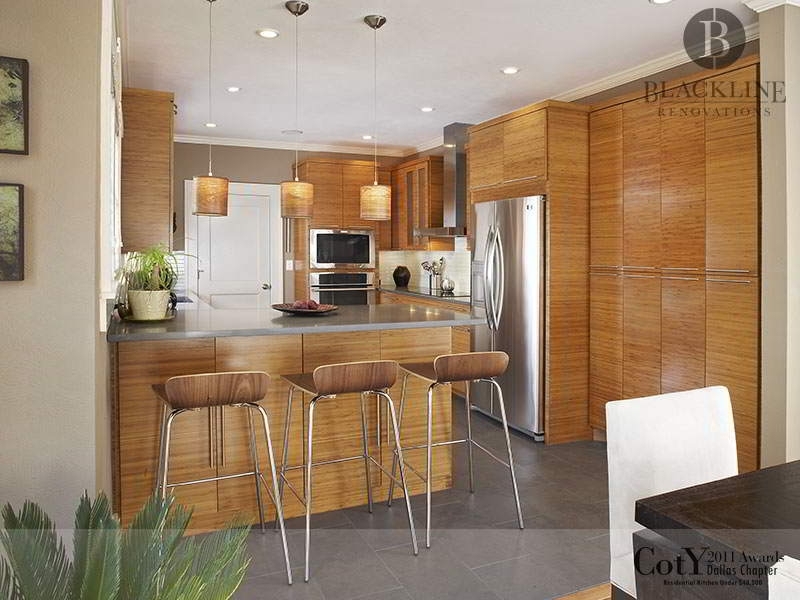 We opened up the space to the breakfast room and installed new full overlay bamboo cabinets and Caesarstone countertops. The new layout doubled the size of the kitchen and the modern finishes really updated the overall aesthetic. 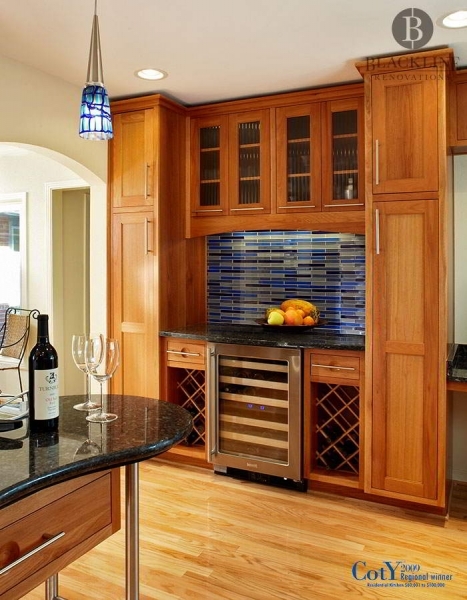 The homeowner had two main needs for this project: fix a poor layout and update a bland look. The original kitchen was tiny and lacked storage and counter space – all of the appliances were freestanding, including the dishwasher. 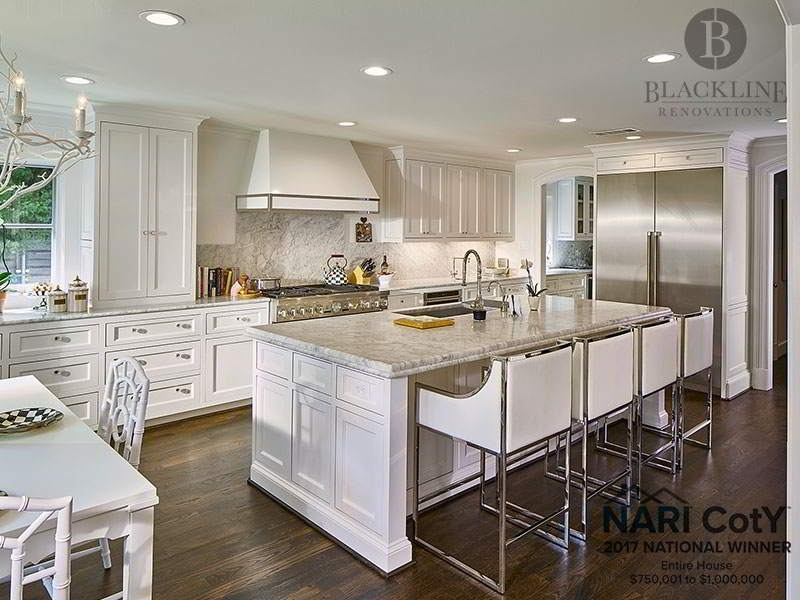 The homeowner’s goals on this project were to improve the layout of the kitchen, increase storage space and install higher end materials. By relocating the stacked washer/dryer to another room, and installing a new tankless water heater in the attic, we were able to utilize the extra space to make the layout of the kitchen flow better. 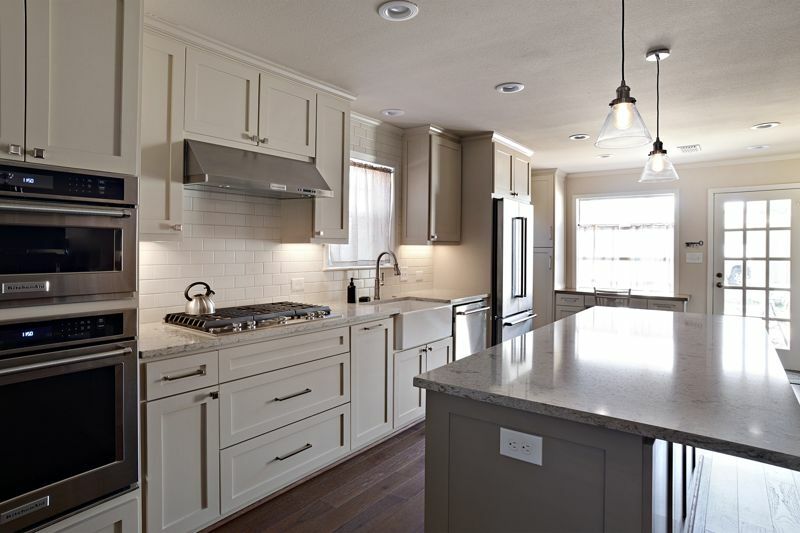 New cabinets with a custom glaze and paneled details, granite countertops, and travertine tile backsplash created a high-end look and feel to the space. The homeowner’s goals on this project were to improve the layout of the kitchen, increase storage space and install higher-end materials. The original kitchen required some work. There was only one oven, a microwave on the countertop, yellow plastic laminate countertops, and the previous owner had boarded up 2 windows to install cabinets. 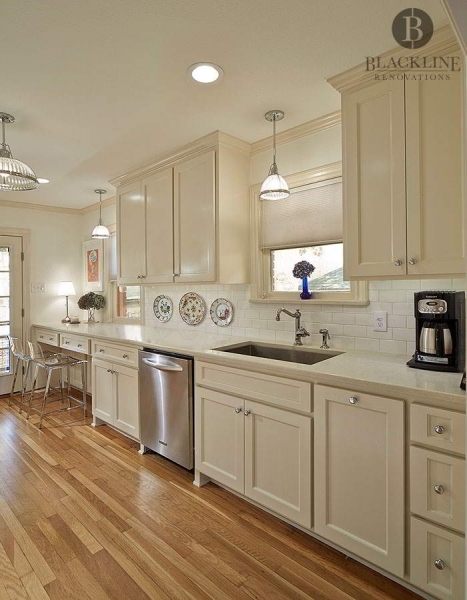 The kitchen was completely gutted and redone to include seating, an island, and to increase the function in keeping with the craftsman style of the home. We installed new custom cabinets, a built-in bench with table, and installed new windows where the original windows had been boarded up. With a new baby on the way, the existing home was just too small for our homeowners. We added 1,100 square feet on 2nd floor including, a master suite, two bedrooms, Jack & Jill bath, and laundry. 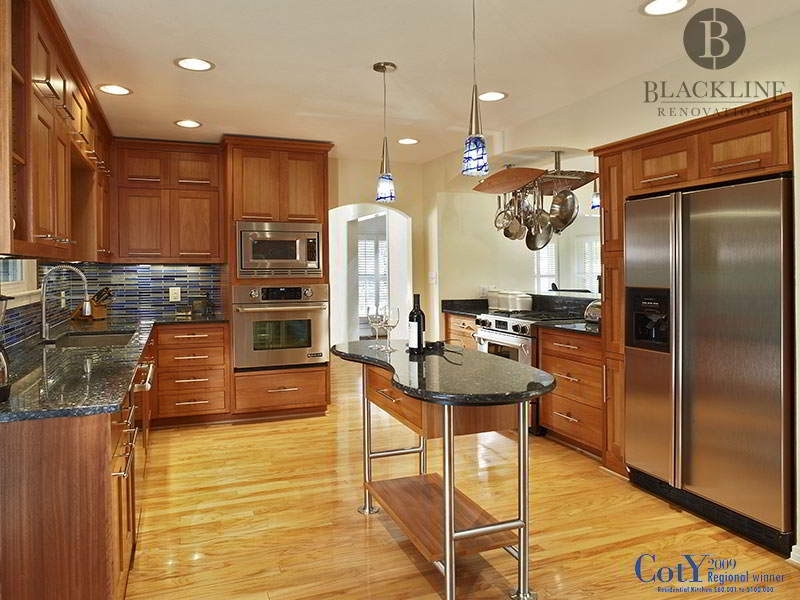 We removed the wall between the kitchen and back bedroom to create great room and completely remodeled the kitchen. We added 1,100 square feet on the 2nd floor, including a master suite, two bedrooms, Jack & Jill bath, and laundry. We removed the wall between the kitchen and back bedroom to create a great room, and completely remodeled the kitchen. The client wanted an accurate historical restoration, while also using modern technology to make the home more functional for today’s living style. They bought their “dream home” 10 years prior at a great price due to the amount of work it needed. After many years of struggling to do the renovation themselves, they realized to achieve their dream, they’d need to hire a professional. All modifications had to be within the footprint of the home due to zoning. We integrated the homeowners need for more working space in the kitchen by utilizing the original walk-through pantry area that wasn’t being used, and added that space to the kitchen. All materials were selected with beauty and function as the main priority. The subway backsplash tile, inset cabinets, farmhouse sink, period lighting, beadboard ceiling, and pine floors were all chosen/selected with the period the home was built in mind. Remodel was being done as a gift for her daughter. The kitchen had a horrible layout and hadn’t been touched since the home was built. 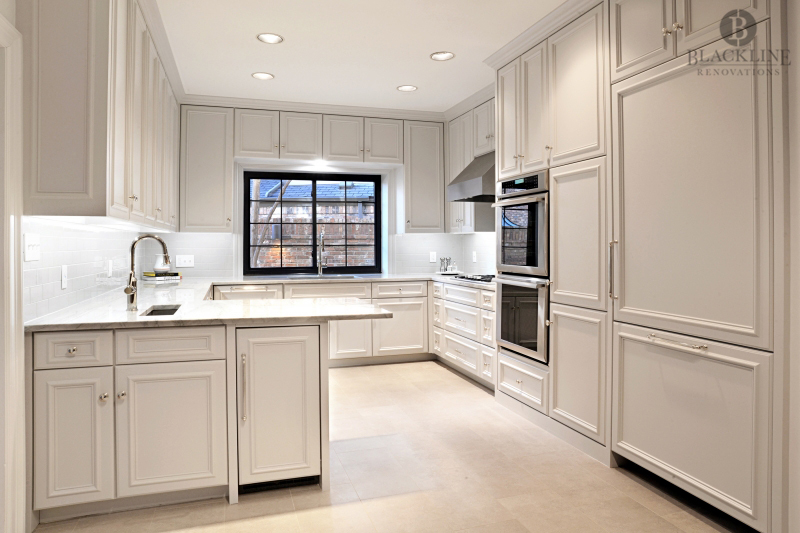 The kitchen was completely gutted and reconfigured to maximize the space in the galley style kitchen. The doorway from the kitchen to the dining room was widened to mimic the French doors on the opposite side. This remodel was done as a gift for the client's daughter. The kitchen had a less-than-ideal layout and hadn’t been touched since the home was built. 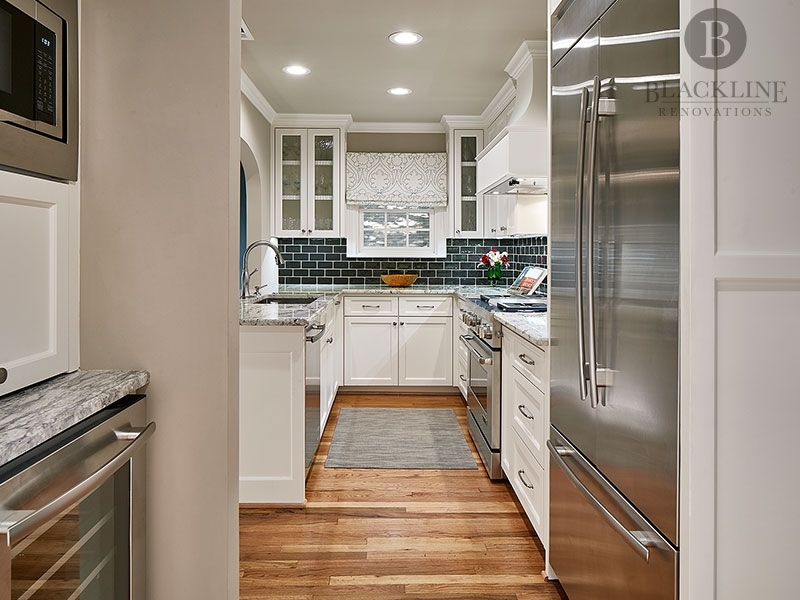 The kitchen was completely gutted and reconfigured to maximize the space of the galley style layout. The doorway from the kitchen to the dining room was widened to mimic the pre-existing French doors on the opposite side. This single-story, 1,500 square foot, Tudor home was too small for the clients, their child and dog. The existing kitchen and master suite were very closed off and did not allow a good flow through the space. The renovation called for the removal of two thirds of the old roof, as well as adding an upstairs playroom, laundry room, two bedrooms, a Jack and Jill bath and a small, decked attic storage space. 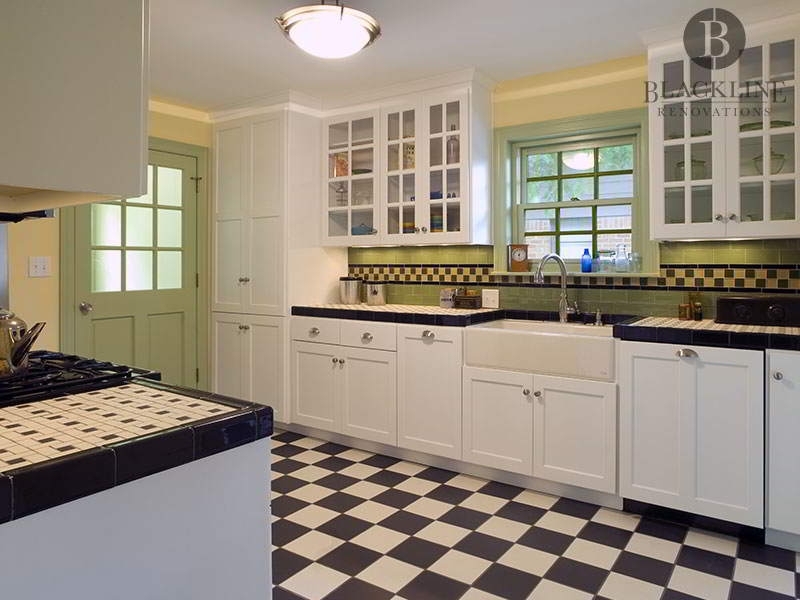 The rest of the existing downstairs was completely remodeled, including this classic Tudor kitchen. At only 90 square feet, the original kitchen was extremely small. So small, that the refrigerator was in the breakfast room, preventing that room from being used for anything else. Additionally, there was no countertop adjacent to the range, nor was there a laundry facility in the home. We expanded the kitchen to 137 square feet by utilizing two unused closets adjacent to the space. This allowed for us to relocate the refrigerator from the breakfast room to the kitchen, and allowed for us to add counter space on either side of the new range. We were also able to add a small addition to incorporate a laundry/mud room. In this project, the kitchen was original to the home, and the homeowner was overwhelmed with where to begin. As with most homes built in the mid-century, the kitchen was closed off from the living area and had a very low ceiling. 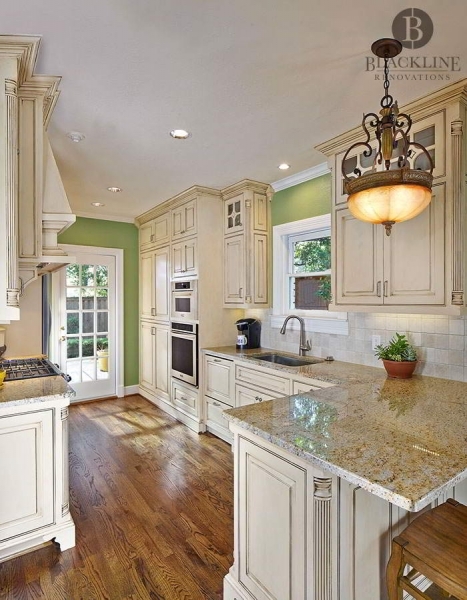 The cabinets, flooring, lighting, appliances and countertops were completely outdated and broken. This is the kind of project in which Blackline loves to be involved. 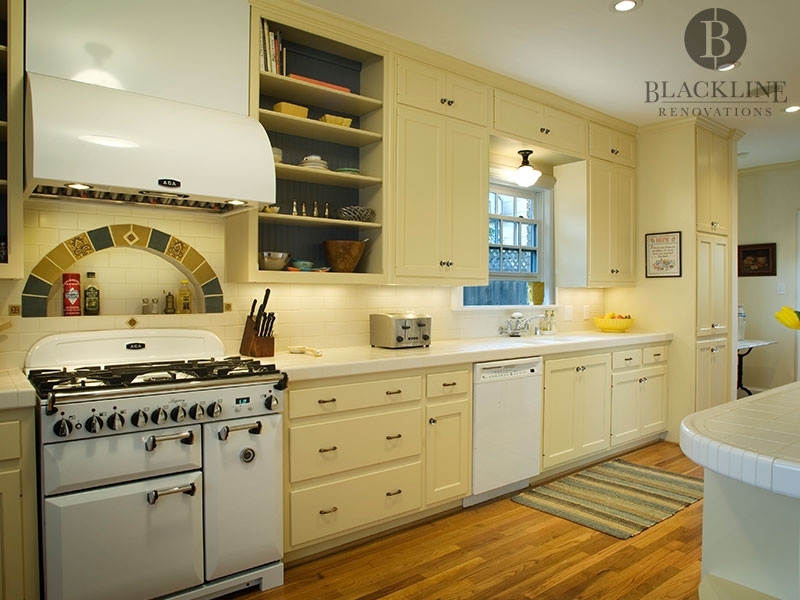 Blackline’s organized approach and proven process put the owner at ease when initially discussing the process. 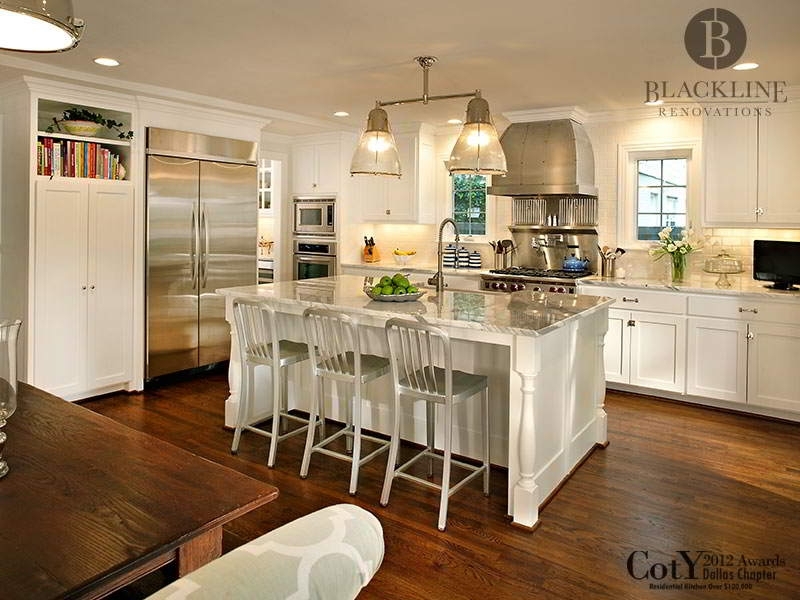 Blackline completely gutted the kitchen and created an open space with a classic, clean feel to match the updated design of the rest of the home.